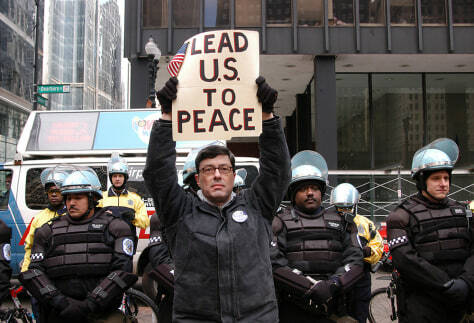 Malachi Ritscher holds up a sign during an antiwar protest in Chicago in this photo from April 2003. On Nov. 3, Ritscher set up a video camera, doused himself with gasoline and lit himself on fire on expressway off-ramp in downtown Chicago. War protesters are hailing him as a martyr.